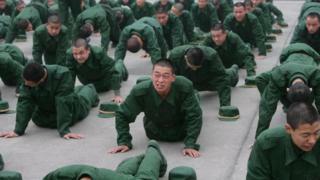 The Chinese military has come up with some advice for would-be recruits on how to pass physical tests, sparking amusement among social media users. In an online post, the People's Liberation Army (PLA) blamed overconsumption of fizzy drinks, excessive computer gaming and even masturbation for the poor health of young people. It said physical test failure rates had reached an "alarming high", with at least half of the candidates failing in one city. The military has been struggling to find recruits in recent years, despite its heavy promotion of patriotic "heroes" and military TV and film dramas. The PLA's advice appeared on its official "ChinesePeoplesArmy" account on WeChat, a WhatsApp-like mobile messenger, on 19 August. Spend less time in front of screens: 46% of candidates failed eyesight tests, which the outlet blames on "reliance on mobile phones and other electronic devices"
The post quickly attracted widespread mockery, and thousands took to the popular microblog Sina Weibo to discuss it. "Next year they'll be asking for circumcisions!" said one user. Another user said they suspected "having a birth mark is probably too much". "How are there so many unhealthy people?" one user asked. Many people weighed in with why they would fail a PLA physical, mainly because of poor eyesight. Others identified a decline in standards among young people. "Today's youths live too comfortably," said one user. The military has staunchly defended its rigorous recruitment process, with the defence ministry saying it has "strict rules and procedures". "The quality of our recruits is guaranteed and the headwaters of our military will flow long and strong," it added. Many social media users, however, say they suspect that the post was intended to encourage enrolment because "money is not being sent to the army". Last month, the Ministry of Defence announced plans to downsize the PLA from an estimated two million to one million. It said this was intended to boost other branches of the military and to meet evolving security requirements, but some users speculated that it was because of falling numbers of recruits. Poor conditions in the military have been highlighted in the media, with reports of low pay, bad food, poor prospects for marriage and difficulties in finding jobs after demobilisation. The military has turned to unconventional means to try to boost recruitment, including releasing a rap music video last year.